Go to the #Apr13 ‘Stop the Robbery’ Protest this Saturday! Yes, You! This Saturday(tomorrow!) at lunchtime, the #Apr13 ‘Stop the Robbery’ protest takes place. 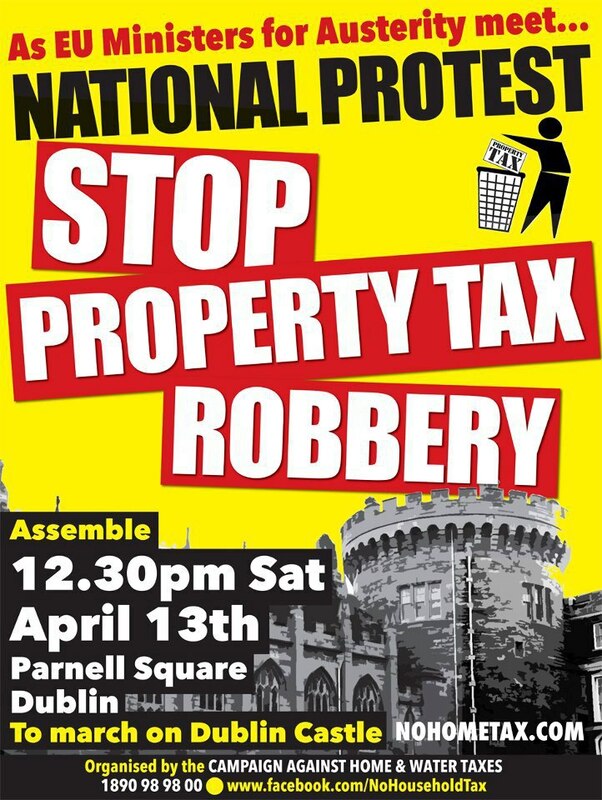 Called by the Campaign Against Home & Water Taxes and organized in conjunction with some of the anti-CrokePark2 trade unions and various other campaign groups, it begins at 12.30pm on Parnell Square in Dublin. The plan is to march to Dublin Castle where EU Finance Ministers(like a mega-Troika) are meeting as part of Ireland’s EU presidency. They will be discussing the usual; how to put a presentable face on looting and pillaging the most vulnerable in society and tossing vast swathes of the continent onto the fire to keep banks and industry warm. Lucifer himself is rumoured to be attending to collect the souls of everyone under 25 that have been promised to him(yiz never read the Austerity Treaty, did ye??). So slap together some witty homemade banners(enough with the Fr. Ted ones though..), work out how you can march with the 4 different blocs you said you’d march with, and make sure you get there! It’d be damn great if thousands of us turn up and showed the rest of Europe that, actually, we’re indignant too and we’re ready to do something about it.